Sometimes it is good to have well connected friends. I went to Brewforia for lunch today and my buddy Rick who owns the placehad a friend drop this baby off for him a couple weeks ago. I had heard that there can be a lot of issues with Pliny if it is too old. Not a problem here, as this beer was bottled on August 18, so just about 9 weeks ago. It was bright and fruity, and just as crisp and refreshing as I remembered the last time I got a taste in August of 2010. I’d say this year’s batch was a little bigger on the fruit, and not quite as floral as last years, but it was still an outstanding beer. I know Jim thinks this stuff is over rated, but I do not. I thought it fit its billing as one of the greatest beers in America. That doesn’t mean that there is no brew out there that is better, I actually think ranking beer is a bit like saying what is better dimensional lumber or an apple, but I would put it in my personal top ten. Loved it, thought it was great. Also be looking for some changes around here too. If everything goes according to plan you should be able to purchase posters of some of Jim’s infographics in the not too distant future. So have you ever had Pliny? What were your thoughts? What is the hardest to get beer you have ever gotten a taste of? Let us know in the comments. Really? They can purchase my stuff? I can’t wait to hear how THAT’S gonna happen! Pliny’s okay. I’ve had some fresher than that. It was good, but I feel like I’ve had plenty that are better and much, much easier to get my hands on. 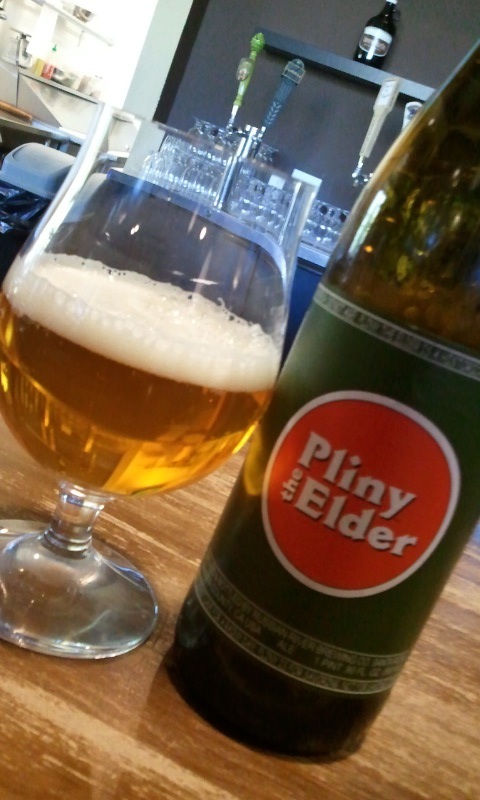 I feel like their are good local options too, but it is always a treat to get a taste of the Pliny. I wouldn’t go way out of my way to try this beer, but I appreciate having the opportunity. If it was available for sale locally, I certainly would put it on my buy list. Wow, I’m betting those bars were a bit like the Tokyo Subway during rush hour! Took the words out of my mouth. I thought it was good, but nothing I would go nuts over. The Younger was by far the hardest to get a taste of. I had to go to three different places in Seattle before I got to try it – and I got to the bar 2 hours before it was supposed to be tapped. I’ve never had the Younger. My understanding is they only sell that in kegs, so no bottles out there. I have seen growler fills for sale on e-bay though. You’d have to be a fool to buy a growler of anything on e-bay! Wait, what? You didn’t tell me you were having lunch at Brewforia! I feel dejected. I was in when that case of Pliny got brought in to the shop. Father of a Brewforia customer. Swear the guy looked pretty much like Santa Claus. Nice gift, I’d say. I got some, too. Thanks for sharing Rick! And thanks to whoever the generous customer was! Son of Santa Claus, I presume. Yeah, that would be Rick Clause in our case! 🙂 It was a business lunch Chad, otherwise I would have invited you along. Rick is awesome, and always so willing to share. We should set up another ungettables lunch. I have one from New Glarus and some Duchesse du Burgonne that I picked up last time I was in Wisconsin! Funny you should say that. I’m looking at the 2nd or 3rd week of November for the next Ungettables Tasting. Probably a Monday or Tuesday at Brewforia. Noon-ish to 5-ish. So, you may want to take a half day or something. I’ll finalize the deets this week and let you know! Sounds great Chad. The New Glarus is a 750, but the Duchesse is like an 11.2 oz bottle. We’ll have to go light on that one! I’ve had many Pliny’s over the years. I used to worship this beer, but I don’t feel like it is what it once was. But my perception may have also shifted as the game is being played by many other worthy contenders as well. I think Laurelwood’s Workhorse IPA is the finest IPA I’ve had. Laurelwood’s beers are top notch to begin with, but I agree, their IPA is one of my favs, and easily available in Seattle. I had my first one a couple weeks ago. I can’t get it here in Ohio. I thought it was great, but with the hype, I expected it to be life-changing, and it wasn’t. I think that is putting too great an expectation for any beer to live up to. I think it is a great beer, but it is still just a beer. It was fun to get a taste, but life change is for big things like love and marriage, and earthquakes and bears. I liked it, always a solid brew but it’s actually news to me that it was that hard to get. Every time I had Elder was almost a coincidental find (much like yours by the sound of it) so I suppose if I was actually seeking it out I probably wouldn’t find it. I think it really depends on where you live. I live in Idaho. Some would say a wasteland for beer, but my buddy Rick at Brewforia is trying to change that. But if you live in a place where it is distributed, then you may run into it on occasion. I don’t go seeking it out either, because that would be silly. I think Pliny was/is a benchmark beers for IPAs. It is consistently good where as other IPAs sometimes change recipes or fall off a bit (see also: DF 120). I would agree with that assessment John. It is like the Elvis of Beers. Elvis was the king, but then he got all whacked out on drugs and then he died. There are other more talented singers, but he is still the king because he was transformative of his industry. Pliny is a bit like that, except for the death part. So Pliny also goes well with peanut butter and banana sandwiches? I liked it a lot. I think you won’t be disappointed. I had it on tap about 6 weeks ago. I called it overrated and caught a load of crap for it (courtesy of our friend The Alemonger). It was good, but the Lost Abby 10 Commandments and the Rodenbach Gran Cru were infinitely more interesting. I know that they are totally different beer styles, but two out of three made a lasting impression, while the other one was just ok (allright, it was better than ok, but not quite a religious experience). And I’m with you on the whole ranking thing. Kind of silly, especially when the playing field is changing constantly. It makes me feel better that the Alemonger loves Pliny too. I guess I’m just a bandwagoner or something, because each time I’ve had this I come away with feeling I was really glad to have it. I don’t get that with a lot of other IPAs. I loves me some IPA! Have you had Ballast Point Sculpin, Lagunitas Hop Stoopid, or Firestone Walker Union Jack? They are all quite tasty. I haven’t tried any of those yet G. I’ve heard nothing but great things about Sculpin, and although I can get the Lagunitas anytime I want it, I’ve backed off from them ever since I heard they were going through growing pains. There not even making Brown Sugga this year because they can’t afford to tie up their fermentors for as long as this beer takes. I have yet to see Firestone Walker in Idaho. I’m fond of the Hop-Stoopid too, haven’t tried the others yet. You should definitely give the Hop Stoopid a try. I was pleasantly surprised by it (thought it was gonna be over the top bitter, but it wasn’t). I’ve grown to really like Lagunitas. Quite an interesting brewery. And the labels are hilarious (Hairy Eyeball is too damn funny)! As far as Firestone Walker, I have a Double Jack in the fridge that I’m waiting to try. Well Founder’s Canadian Breakfast Stout is known to be amazing in this area, and I think it sold out within a day. I had some of that and it is drop-dead tasty. Definitely a favorite of mine. Yeah, I’d love to get a taste of that, but unfortunately in this country beer tends to flow from west to east. It is usually a lot easier for me to get Washington, Oregon, and California beers than it is to get something from the east, so it probably isn’t going to happen anytime soon. Enjoy your CBS!